Justice Minister Tzipi Livni defends Kerry's boycott threats against Israel, claims 'settlements' build 'wall of hate' against Israel. 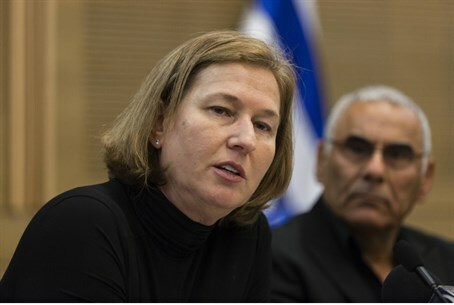 Justice Minister Tzipi Livni (Hatnua) opened her weekly party meeting Monday with sharp attacks against criticism of US Secretary of State John Kerry by senior Israeli officials. Livni tried to explain away Kerry's boycott threats against Israel, saying that "[When] the leader says to us, 'friends: the reality is going to change in the event of a political deal [between Israel and the Palestinian Authority],' this does not constitute a threat to the State of Israel, but rather defines reality as it is," Livni claimed. "It's just like when someone returns from a trip and warns his friends against a storm raging there - that's not a threat, it's warning his friend because he cares about him and worries about his well-being," Livni continued. "Some of those who ranted against the Secretary of State, if they had known what Kerry did to prevent these threats and these boycotts - they would be humiliated and hide their eyes in shame," Livni fired. Those words - which echo similar sentiments by a US State Department spokeswoman - stand in sharp contrast to previous reports that John Kerry was in fact a key player in orchestrating European boycotts against Israel in order to exert pressure on the Jewish state. Livni went on to attack Israeli construction for Jewish communities in Judea and Samaria. "Every stone being placed in an isolated settlement hurts the chances of a peace deal and places another stone in the wall which will isolate Israel and the world," she insisted. Kerry's comments at the Munich Security Conference Saturday have sparked an immense backlash from the Israeli government. He said then, "today’s status quo absolutely, to a certainty, I promise you 100 percent, cannot be maintained. It’s not sustainable. It’s illusionary," Kerry stated. "You see for Israel there’s an increasing de-legitimization campaign that has been building up [. . .] there are talk of boycotts and other kinds of things. Are we all going to be better with all of that?" Prime Minister Netanyahu responded forcefully to the threat. "Attempts to impose a boycott on the State of Israel are immoral and unjust," Netanyahu stated, at the opening of his weekly cabinet meeting. "Moreover, they will not achieve their goal. First, they cause the Palestinians to adhere to their intransigent positions and thus push peace further away. Second, no pressure will cause me to concede the vital interests of the State of Israel, especially the security of Israel's citizens. "For both of these reasons, threats to boycott the State of Israel will not achieve their goal," Netanyahu concluded.